Reflowduino is a fully Arduino-compatible ATmega32u4 board with Bluetooth (BLE), thermocouple interface, LiPo charging, buzzer, and more! 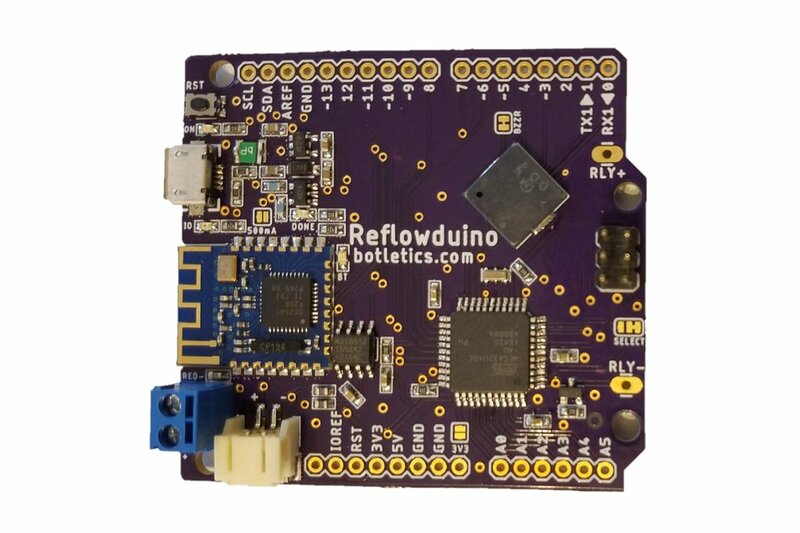 Reflowduino is an open-source, Arduino-compatible board based on the ATmega32u4 microcontroller specifically designed for the purpose of wirelessly controlling DIY reflow ovens or anything else that might need temperature control with a relay interface. It is fully-documented on Github with example reflow oven PID control code, demo Android Bluetooth app, step-by-step wiki on how to get started, and other great documentation! There are a few reflow oven controllers out there but they were too specialized and I couldn't find any that allowed a great level of customizability and use as an all-around great development board, not to mention wireless interface. 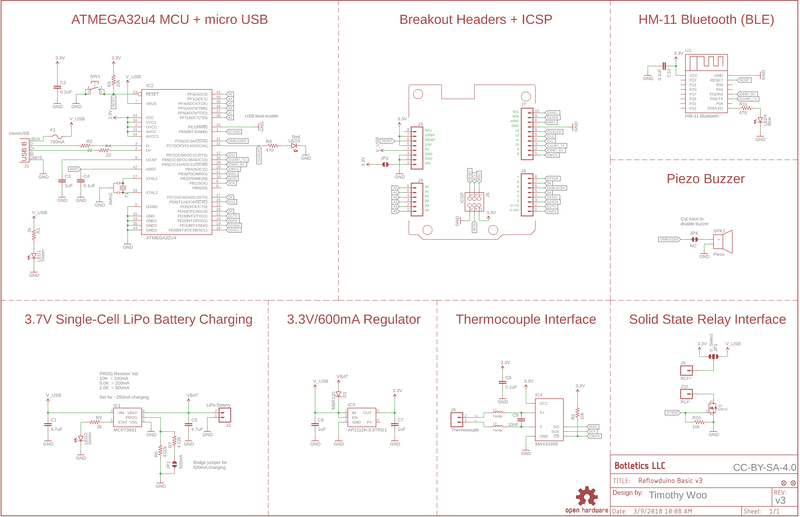 Reflowduino has all the bells and whistles (literally) that you'll ever need to get started with your own reflow oven build, especially if used in conjunction with the Sidekick relay module! 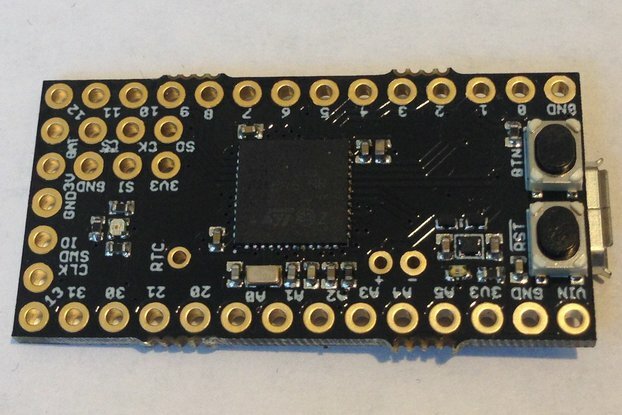 ATmega32u4: This nifty little microcontroller is the same powerful brains of the well-known Arduino Leonardo with USB-to-serial conversion all handled inside the chip! The board operates at 3.3V, not 5V, so please use level shifters if you are interfacing the Reflowduino with 5V logic! Micro USB Connector: A micro USB powers the board, charges a LiPo battery (if it's there), and can also be used to program the board. Resettable Fuse: The Reflowduino uses a resettable PTC fuse rated at 750mA to protect your board from drawing more than that amount of current from the USB port! Simply removing the short (assuming this was causing the problem) will "reset" the fuse back to normal! Indicator LED's: A green power LED lights up whenever the board is powered (either by micro USB or by a LiPo battery); another green LED lights up when the LiPo battery is done charging via the micro USB cable (if a battery is used); a blue LED flashes when the Reflowduino isn't connected via Bluetooth and turns solid when a connection is made; and a user-controlled red LED can be used for debugging, or, the in case of the Reflowduino demo code, can be used to indicate whether the reflow process is underway. 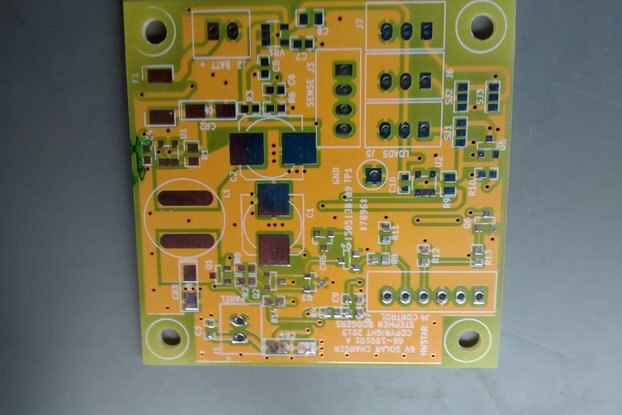 Voltage Regulator: The Reflowduino has a 3.3V/600mA regulator for powering the ATmega32u4, Bluetooth module, and other things that you might want to connect to it! Thermocouple Interface: The board includes a MAX31855 thermocouple-to-digital converter chip for reading temperature via a K-type thermocouple (included with any Reflowduino purchase). Bluetooth: An HM-11 Bluetooth 4.0 Low Energy (BLE) module allows easy-to-program wireless communication and real-time data transfer between the Reflowduino and a mobile app, eliminating the need for expensive displays that use up a bunch of GPIO pins and eat up space! The Bluetooth can also be used to enable custom functions and user interfaces from the open-source app, allowing for endless possibilities! By default the app shows the real-time thermocouple temperature, graphs the reflow temperature in real time, shows when the reflow process if complete, and saves the data for you to analyze later. 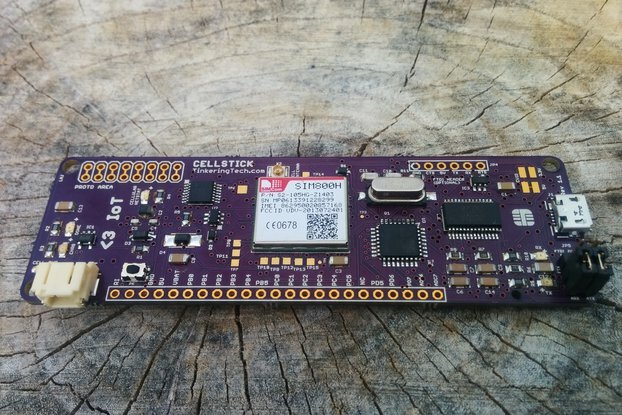 These features can be expanded to work with display shields, custom Bluetooth applications for other operating systems, special button functions, and more! LiPo Battery Charging: A 2mm JST battery connector and charging circuit allows you to use a standard single-cell 3.7V LiPo battery with a capacity of at least 250mAH. You can either keep the Reflowduino plugged in via micro USB or use a LiPo battery, or both! If both are plugged in, it will automatically use the micro USB power. The charging current is 250mA by default, but you can solder a jumper to set it at 500mA. Solid State Relay (Pro version only): The Reflowduino Pro comes with an opto-isolated solid-state relay rated at 25A/240VAC (max specs with convection cooling) or 10A/240VAC (which translates to 20A/120VAC) without active cooling, which is all you should need since your outlet can only supply 15A before tripping (at least in the US). If you get the Reflowduino Basic you will need to purchase your own solid-state relay, but no worries; the board has large, easy-to-solder pads that can be used to wire up the relay without tangling up the rest of your project! The board also has a solder jumper where you can cut the default 3.3V relay control trace and bridge a new trace to the USB voltage (5V) in case your external relay input won't operate at 3.3V. Buzzer: A piezo buzzer lets you know when dinner's ready, or you can have it play lullabies!